(The Pavement, 17 July 2012) “Hold on a minute.” Seconds after meeting Mark Horvath, founder of pioneering US video blog Invisible People, he disappears into the crowd outside Charing Cross station. He’s spotted three sitting men by the entrance and wastes no time in getting acquainted. “You guys sleeping rough? Want some socks?” he asks cheerfully, before kneeling down to chat properly while commuters stream by unseeing. Horvath seems to have a radar for homeless people, which is unsurprising given he has dedicated his life to trying to help them. One of the men agrees to be filmed and as he recounts his experiences, passers-by look over curiously. With a camera in his face, he’s no longer invisible. 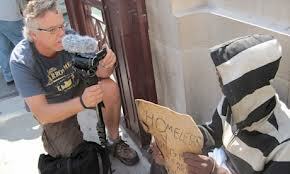 Making homeless people visible is exactly why Horvath set up InvisiblePeople.tv in 2008. Some 17 years ago he too had been homeless, living on Hollywood Boulevard, and knew what it was to be ignored, to not be able to tell his story. He managed to rebuild his life, built a successful career in television and settled into a three-bedroom house (“I know the best of both worlds – I know how to dumpster dive and how to tie a Windsor knot”) – and then economy crashed around him. Facing homelessness for a second time, he decided to set up Invisible People and go on the road. “It wasn’t the best timing. I had just lost my house to foreclosure, was facing my own financial crisis and it was a really dark time.” However he was embraced by the social media community and the site flourished. Today Invisible People has three million views on YouTube and 18,000 followers on Twitter. “The amazing statistic about Invisible People is the amount of people that stay,” adds Horvath. “Twenty-five per cent stay longer than 10 minutes and 14 per cent stay longer than half an hour. That’s huge.” Its success is the subject of upcoming documentary @home, which follows Horvath on his 2010 Invisible People road tour, meeting homeless people from Las Vegas to LA. Already the site is populated with videos of people he’s met so far in London. The first features 22-year-old Natasha, who has been living on the streets of London for four years. Leaning on her crutches, she quietly explains why she hasn’t been housed (“I’m not a drug addict, I’m not an alcoholic and I’m not pregnant, and they’re three things that get you help”) and her face lights up as she shares her dream of being a writer. And despite the negative feedback, Horvath is still a big believer in the transformative and supportive power of social media. “Social media saved my life and it helps me save other people’s lives… Love and reciprocity plays really big on social media. If you’re good to people and real and tell a story people are going to react to that in a positive way.” As well as Invisible People he has set up We Are Visible, a website offering homeless visitors advice in social media literacy, from how to set up a blog to tweeting. “When I first started this I thought when a homeless person in Phoenix, Arizona or someplace says ‘I’m hungry’, the service providers would be on Twitter and say ‘hey, we have food’” says Horvath. “But what happened, which was a little more gorgeous, was homeless people helping homeless people over social media. Then I realised the power of peer-to-peer support.” In response he is in the process of turning it the site into closed network for people to help each other. Horvath is optimist change can come. “When I was a kid I was a rebel, and if I saw any injustice I fought, I screamed, I yelled. And the only thing that changed was me. Now that I’m older I believe you have to work within the system, you have to make friends not enemies. I come in and say ‘hey, system’s broken, how can we fix it together?’” This approach is bearing fruit. In Arkansas, a farmer donated 40 acres of land that is being used to feed 150 low-income families a week. The Canadian government commissioned Horvath to go to 24 cities in Canada to help champion the Canadian Alliance To End Homelessness, which he says “will save thousands of lives and a lot of money”. Terry Pettigrew was reunited with his long-lost brother shortly before he died of cancer, after the Calgary Times put Horvath’s interview with Pettigrew on its front page. And that’s just the beginning.